The insulin must be injected into the subcutaneous fatty tissue. 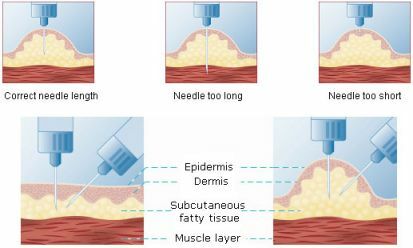 Always inject the insulin into the fatty tissue between the upper layers of the skin and the muscle. Injecting into the subcutaneous fatty tissue results in the insulin being distributed and absorbed well. Inadvertently injecting into the epidermis or the muscle leads to insulin activity that is difficult to predict, and can therefore result in fluctuating blood sugar levels. It is recommended that you inject insulin into the fatty tissue of the abdomen, buttocks, or the outer side or front of the upper thigh. Keep at least two fingers width (3 cm) away from the navel. Avoid injections into the upper arm or the inner side of the upper thigh as there is a risk that you might inject into a muscle. You should inject insulin at the same times every day and always in the same part of the body (but at different injection sites), so that you can estimate the insulin action more accurately. It is important to note that insulin absorption and action is quickest when injected into the abdomen, followed by the upper thigh and the buttocks. Short-acting insulin is usually injected into the abdominal area to achieve a rapid effect. Long-acting insulin is usually injected into the upper thigh or the buttocks because the duration of action is prolonged there. Change the injection site after each injection, if possible according to a fixed 'rotation principle'. The sites should be at least 3 cm away from each other to avoid tissue hardening (lipohypertrophy). The absorption and action of insulin is unpredictable when it is injected into hardened tissue or fatty deposits (lipohypertrophy), scar tissue, moles or bruises. You should definitely avoid injecting insulin into these sites.